Yvonne Coomber is a British contemporary artist based in Totnes, South Devon who has a loyal global following. Yvonne’s highly sought-after flowerscape paintings sing of tumbling hedgerows, tangled meadowlands, open moorland and magical forests. They whisper of love. Through her work Yvonne transports the viewer to an effervescent place of happiness; a place where paint smiles. Her mixed media constructions often include glitter, gold leaf and multiple layers of rainbow-strewn glazes and paint that come together to create a perfect harmony. 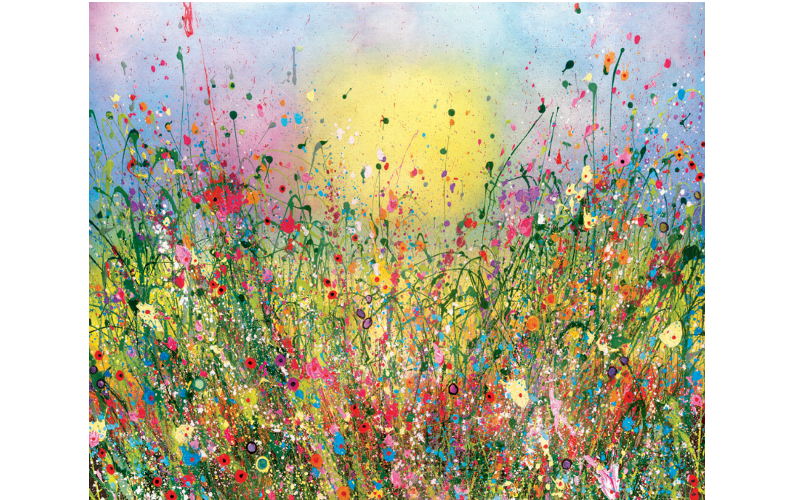 Yvonne Coomber's hand embellished limited edition printed canvas (87x107cm) is entitled "A Thousand Words for Joy" and was inspired by a stimulating TED Talk the artist listened to about joy. This intense feeling of emotion is universally acknowledged within humanity however it is both mysterious and elusive as its unmeasurable. Sharing her love with others is part of the joy of painting for Yvonne, and when she hear the exaltations of delight from my art lovers, my heart is overfilled with joy.